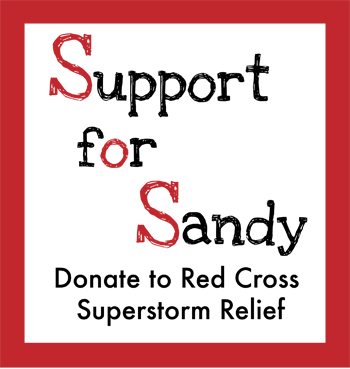 Did you enjoy a short stack & help a good cause yesterday? Who doesn’t love pancakes and helping a good cause? Yesterday, February 28th was National Pancake Day, and IHOP celebrates every year by offering a FREE short stack to customers. They just prefer that you donate what you can to the Children’s Miracle Network. I went with friends and our wait wasn’t long at all either for FREE pancakes! 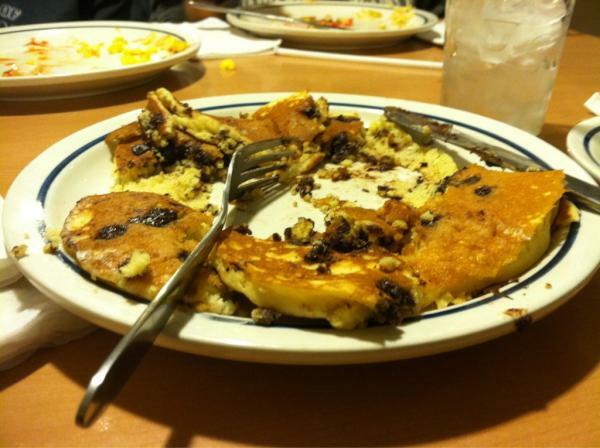 As you can see from the picture above, I devoured delicious chocolate chip pancakes. My bill came to a total of $2.35 and of course I tipped very well, because the waiters have to put up with customers all day. I also made sure I donated before I left. I already am a big fan of IHOP so I couldn’t complain. FYI be on the look out for deals & specials at restaurants on food holidays, you never know, maybe you can get an entree for free or a buy one get one deal! 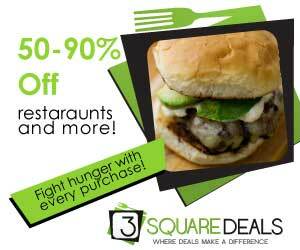 Check out my Twitter feed for up to date food deal tweets @smchickbigdeals! Happy Eating & in this case donating!!! Sushi lovers should head to Sushi Lounge! 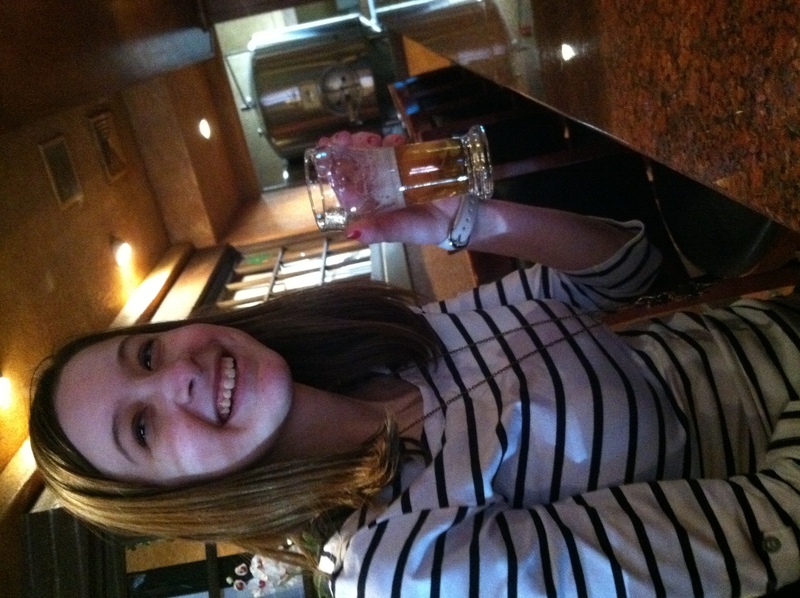 This afternoon I was out with my friend Hope, but before we went shopping we decided to grab lunch in Morristown. Our new thing is getting sushi together, so we decided we’d go to sushi lounge for some mid-afternoon sushi & drinks. Customer Service: 4– We went around 2 p.m. so the restaurant was not very crowded. Our waitress was good and attentive but would kind of drift off sometimes due to it not being crowded. We waited for her to come and take our orders a little longer than I expected for a place that wasn’t crowded since it was in between lunch & dinner. 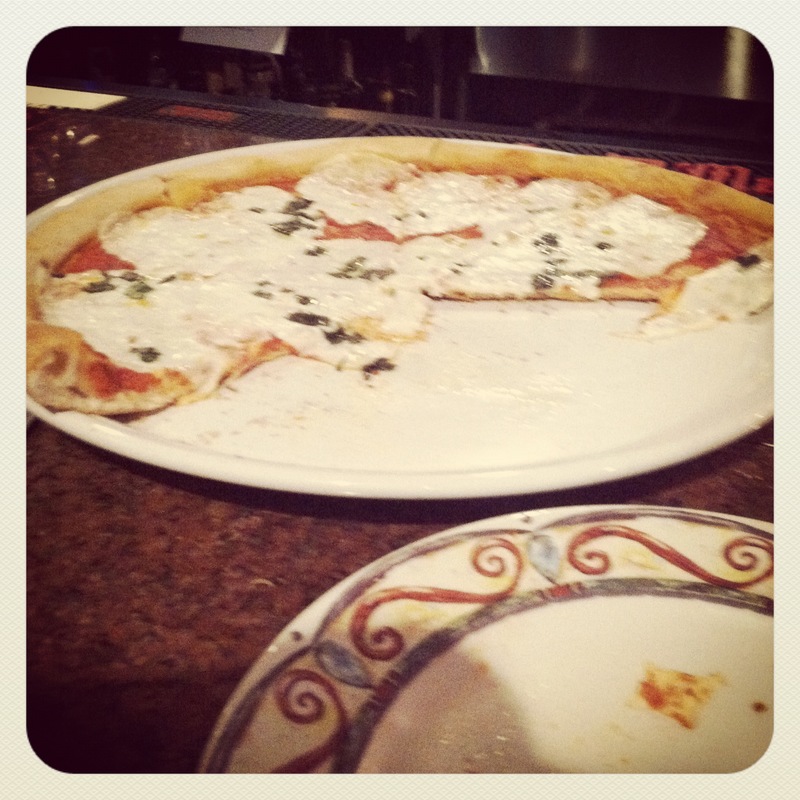 Atmosphere/Cleanliness: 5– I love the atmosphere and definitely would love to come for dinner one night. Especially since they have happy hour & drink specials almost every night. I love the atmosphere! Food/Drink Quality: 4 — Well, first off warning, sushi lounge makes very strong drinks. Hope and I got the Champagne Dream expecting a nice delicious fruity lunch drink. Yes, it was fruity & delicious but it was much stronger than we’d like especially since we were going shopping afterwards. I was a tad bit disappointed with the Miso Soup because the broth had no flavor whatsoever. But I loved the shrimp shumai appetizer Hope and I had. Also, the shrimp tempura bento box I got was awesome and came served with a choice of a california roll or cucumber avocado roll, I got the california roll. It also came with a choice of shrimp or crab shumai, I tried the crab shumai for fun, it was good but shrimp shumai will always be my favorite. Oh yeah, I’m not done, it also came with rice. The meal was amazing and in my stomach within seconds with only some tempura veggies left on the plate. 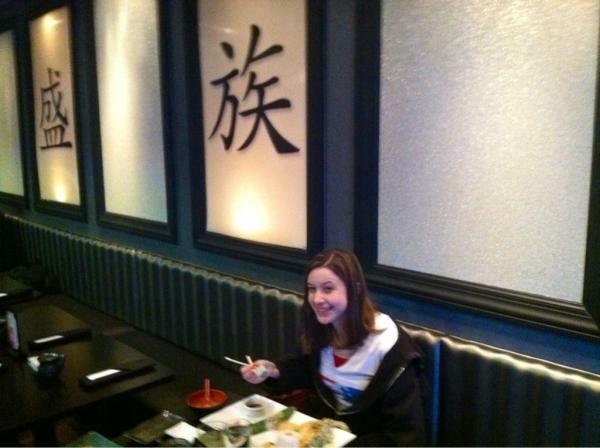 Hope loved the rolls she got– shrimp tempura & spicy tuna rolls. Price: $-$$ — Sushi Lounge can be a bit pricey, my lunch meal was $16 bucks, but it came with a lot and if I wasn’t so hungry, I’d definitely have leftovers. I really wanna come back because as I mentioned they have special happy hour deals & specials every night. I already want to go back and think its definitely worth the money! Final Score: 13/15 — Take out the flavor-less Miso soup and the drinks being a bit unexpectedly strong, which really wasn’t so bad– I was just unprepared. I’d recommend going to Sushi Lounge. If you’re like me and in a college budget lunch is the best priced but as I mentioned they have specials all the time for dinner, happy hour, drinks, etc! Oh yeah and they also have local FREE delivery, which is great! 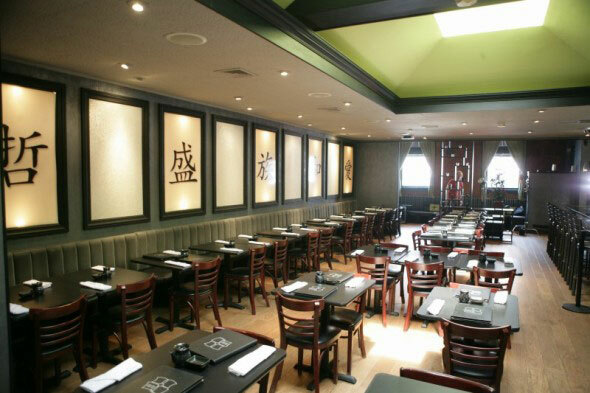 So next time you’re craving sushi and driving through Morristown, go to Sushi Lounge! Contests & Giveaways can be a ‘Big Deal’! Now we all know times are tough which is part of the reason why I began Small Chick Big Deals. But regardless whether it’s food or not I’m always on the look out for contests and you should be too! For a quick background, I’ve grown up living with a family that has always been fond of entering contests, especially my Grandma. She has not only entered 700+ but has one most of them, from concerts to baking a cake at The Waldorf in NYC my Grandma has won them all! So as a kid I always encouraged to enter them and have won a few myself, which I should probably keep a record of. But since this is a food blog and who doesn’t like to eat for free, I’ll tell you about some recent food contests I’ve won and why you should try them too. Have Twitter? Well here’s just one of the many reasons why you should get one, especially if you like contests and giveaways. Just recently I’ve won 2 contests on Twitter which definitely help out the wallet a bit. I won a $50 gift card from Restaurant.com and a $25 gift card to Joe’s Crab Shack. Sometimes you contests on Twitter can be as simple as Retweeting a Tweet and if you are the first one to Retweet you win and sometimes they even select people at random at the end of the day and pick a winner. That’s how the Restaurant.com contest worked, all you have to do is press the Retweet button & done! Restaurant.com is a great site to get gift cards for practically nothing usually $5 tops if you sign up for their email newsletter then save tons while you’re at a restaurant. I love the fact that have these Twitter contests and help people save more! I know I’m looking forward to using my gift card and I have plenty of options of where to use it! Look out for a post just on Restaurant.com in the near future. It’s a great money saver. But in the mean time look out for their Twitter contests and promotions. 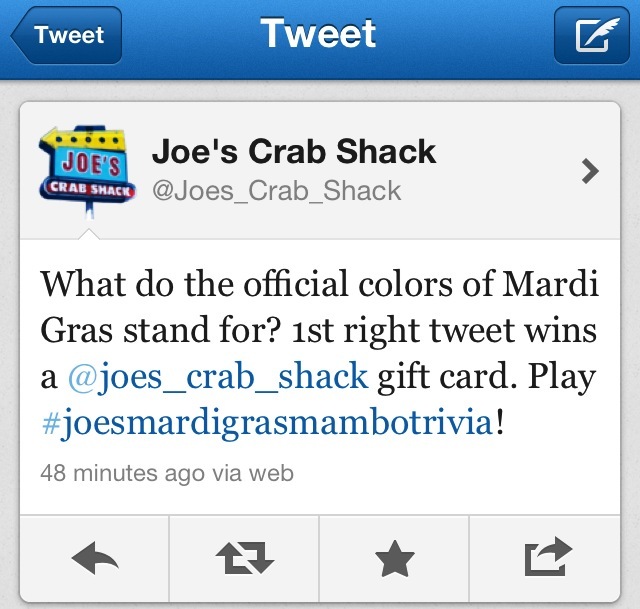 Some restaurants have trivia, for example Joe’s Crab Shack question was what are the Mardi Gras colors and what their meaning is and whoever was the first to tweet back wins. If you don’t the answer you can always google it and you may learn something along the way. It takes two seconds and it’s so easy. I’ve been dying to go to Joe’s since the restaurant opened near my hometown and the gift card will definitely help! Looks like I’ll be having a date with my boyfriend at Joe’s soon! Regardless, whether its trivia or as as simple as a RT (Retweet) you never know what you can win. I love Twitter because it’s such an easy for companies to get in touch with their audience from questions, specials, contests, and giveaways it’s definitely a must for any business. I know when I started I didn’t really get the importance of Twitter but almost 2 years later I use it constantly and know I will most likely forever. Speaking of Twitter, for the most update specials in the NY/NJ metro area– look out for Retweets and some quoted tweets especially when it comes to contests, follow me @smchickbigdeals! I’d love to hear from you! PS: I also recommend entering contests on websites as long as you know they are legitimate. They can be harder to win but you never know you may just be picked the winner! Customer Service: 5 — Our waitress was friendly and let us take our time deciding what we wanted, she brought our second round of drinks pretty quick. Questions about the food were answered right away as well. Atmosphere: 4.5– It’s relatively small but when I went inside it was definitely different then I imagined. It seems like such a small place from the outside looking in. The bar is pretty big for the space it is too. 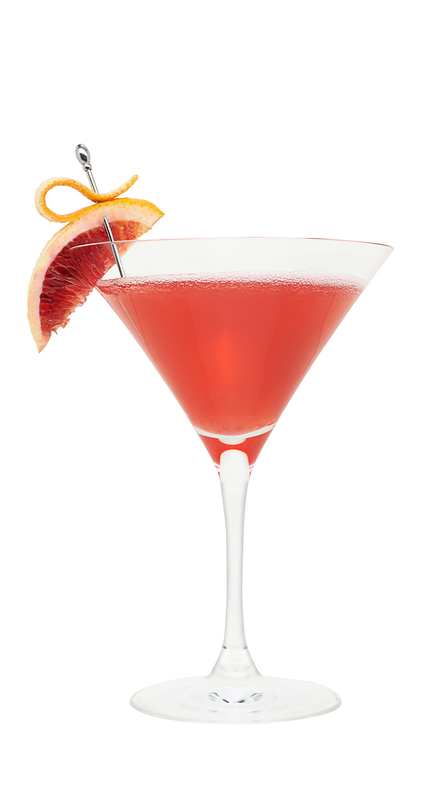 Food/Drink Quality: 4.5– The drinks were great, I usually get a Malibu Bay Breeze and it was made perfectly. My mom and aunt were impressed with their drinks as well. I got the steak bites which is basically 3 skirt steak sliders with cheese. I got them cooked medium well and probably should’ve had it cooked medium because it was a little darker than I had wanted but it still tasted delicious, and I love skirt steak. My mom and aunt were both very impressed with their choices as well. We all shared their “pommes frites” which they serve rather than fries and I loved them. They come served with a chipotle dipping sauce and it’s like a whirlwind of flavor in your mouth! Price: $$ — It’s not the cheapest joint but you can definitely get a delicious lunch with a drink for about $15. Yeah you’re probably thinking that’s not a great deal but they have two for one drinks during there happy hour every Monday-Friday from 2-6 pm and drink specials after 6 as well. Now I’d say that is a deal! Final Score: 14/15– The drinks were made to perfection, service was on key, and it was bustlin’ when we first arrived for lunch. The pomme frites are a great snack to go with a drink too. 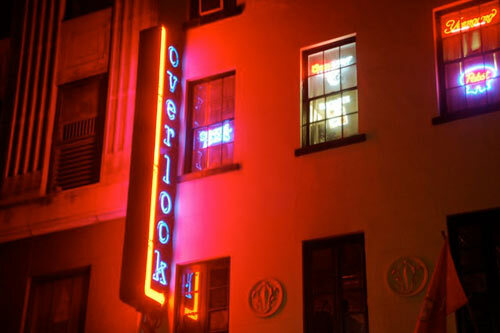 I’d highly recommend going to the Overlook Lounge next time you’re in the city, you won’t be disappointed! I know I’ll be heading there for happy hour sometime! I know this is a bit out of context since it’s a food blog, but I had to take a break and honor the death of a fellow Jersey girl this past weekend, Whitney Houston. Growing up I remember hearing Whitney Houston constantly and loving her music. Her voice was angelic and the music had a great beat to it. She may have made bad decisions but we can only learn from her bad decisions and not do the same. The fact that she passed away this weekend still has me in shock. 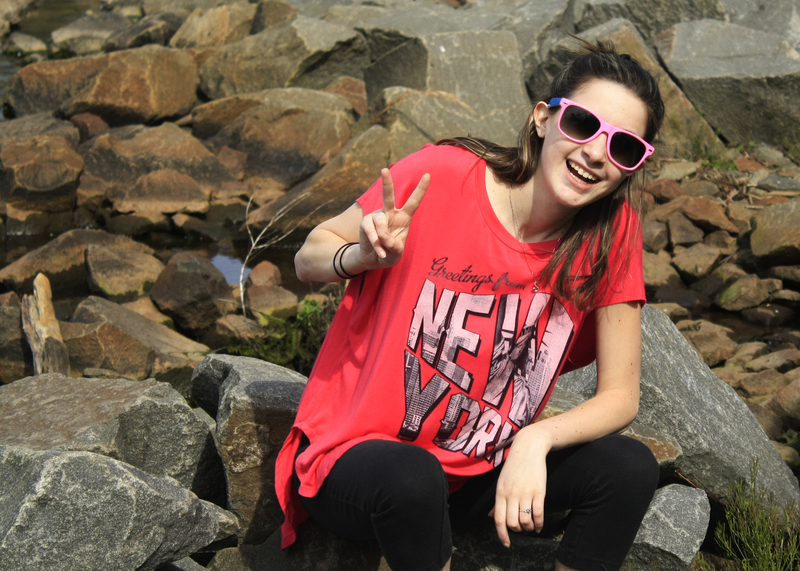 She was also a Jersey girl like me, grew up really close to where I am now. She was so blessed with talent. It was great seeing her tribute during the Grammy’s. My favorite song by her will always be, “When You Believe” featuring Mariah Carey.